Kestra can be found in Relic Chests, and The Arena chest. 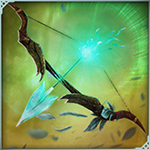 A single arrow released from Kestra's bow will fall as a trio of death. Arrows rain down dealing 57 - 63 damage over 2.50 seconds. 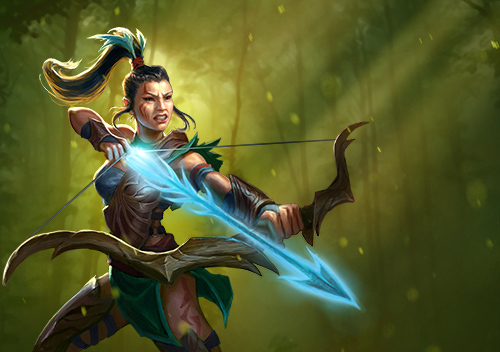 Affected Ranged troops gain 50% increased range and 10% life steal for 7.70 seconds. Marksmanship is unlocked for Kestra at level 31. Rarely fighting from an advantageous position, Kestra has learned how to trick and bewitch her enemies into evening the odds. Manipulate a defence causing it to attack other enemy buildings for 5.00 seconds while dealing double damage. Kestra's speed and grace in battle is gifted to her chosen warriors. Empowers troops with Kestra's agility. Improves movement and attack speed by 50% for 7.00 seconds. Consume to increase the rarity of Kestra. Increased by one step up to a maximum of Mythic.